Peach and vegetable baskets were used, but it was a nuisance to get out the stepladder every time someone scored! In 1893, a carpenter designed a wire rim, with a chicken wire net. It didn’t exactly SWISH! Backboards were designed so that fans, reaching over the railing, couldn’t deflect the shots. Originally, 9 players were on each team… then 7, and now 5. Dr. Naismith once said that there could up to 40 on each team, if the floor was big enough! On your second foul, you had to sit down on the bench, with no substitution (sort of like hockey), until the other team scored a goal, and then you could come back in. On a flagrant foul, you were disqualified for the rest of the game, with no substitution… so your team might be playing with only 8 instead of 9 players. If your team committed three consecutive fouls, the other team was awarded a goal. The 5-second rule was original. If the ref couldn’t tell who hit it out last, the ref would just throw the ball straight out into the court, and whoever got it, got it! The team with the most goals… 1 point per goal. If there was a tie, the captains on each team could agree to play until another goal was scored (so it was sudden death or victory). 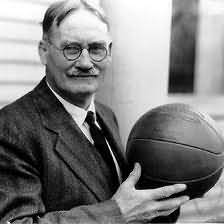 Dr. Naismith suggested the 9 players be arranged on the floor as: a goalkeeper, 2 guards, 3 centers, 2 wings and a "home man" (basket hanger)… no 3-second rule in those days. Dr. Naismith did not want it to be rough like rugby… "The time to stop roughness is before it begins". He found that after a team committed two consecutive fouls, they would really be careful not to foul again, since the third foul would give the other team a goal… and not many goals were scored in those days. The jump shot and the fast break had not yet been invented! Dribbling and ball handling was not as good, with a lopsided ball. After each basket was made, a center-jump was held at mid-court… the other team didn’t automatically get possession. Dr. Naismith was very opposed to the rule change later that eliminated the center jump. He felt that eliminating the center jump penalized the team that just scored. The other team could now take the ball and stall with it for a long time, if they had the lead. The 10-second rule eventually came in to force teams to advance the ball up the court and speed up the game. 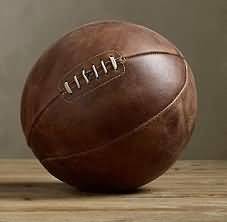 Many teams held the ball for very long periods of time, and the scores were very low. For years, the classic shot was a two-handed set shot with both feet on the floor. In the late 1930's Angelo "Hank" Luisetti (Stanford) developed a one-handed, running shot which was a big departure from the old two-handed shot. He also shot a shot wherein he would jump and release the ball on the way up (not at the top of the jump). 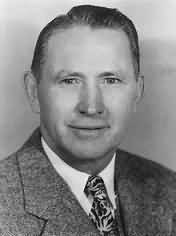 Kenny Sailors (Wyoming) is credited by many as being the first with the modern jump-shot. 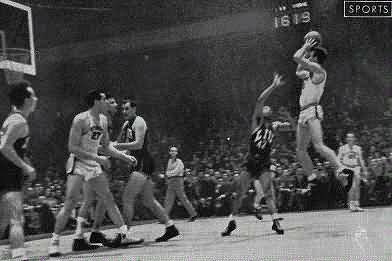 In a game in Madison Square Garden in 1942 (see photo below), he stopped, squared up, jumped, and shot the one-handed shot while suspended in the air with all the fundamentals used in today's jump-shot... and fans would say in amazement, "what was that?!" For even more information about the early years of basketball and it's first great coach, read this book review about "Professor Blood and the Wonder Teams" by Dr. Chic Hess... and get the book. CBS Sports: "Birth of the Jump Shot"